Breakfast with close friends is a favorite thing. Great food, great coffee, and great opportunities to talk and connect. Typically these talks include catching up on life, work, and our goals for both. On this particular morning we were discussing my goal of posting a blog once a week. As soon as we started discussing it, I blurted out. This friend would not let my words pass without intervention. My friend’s words stuck with me since that day. The recalibration of the narrative was helpful. I realized that a lot of the time when I am not actually accomplishing my goals, I use “I am trying” as an excuse for not doing an unpleasant or hard task. 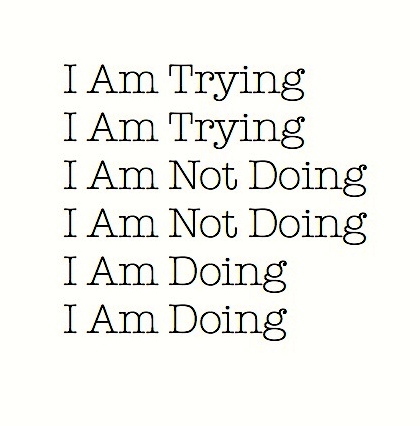 I have become more aware of how often “I am trying” made its way into my life. How often has this narrative kept you from the harder tasks? How has “I am trying” created an obstacle for you? For me, the choice is simple. I am no longer trying. I simply have to do. I guess some ideas can come from galaxies far, far away. Seeing both sides of how this phrase disrupts us….thank you Carl. Where are we allowing our old narrative to take the shine off our accomplishments? I needed that. And where are we letting it be an obstacle? There is freedom in the answering of both those questions. Again, thank you. My pleasure. That freedom is big for me as well. More Doing, Less Trying.